Through my association with Fitfluental, I am incredibly excited to be part of a sponsored campaign in Under Armour's What's Beautiful competition. I was provided Under Armour gear to participate in the competition. All opinions are my own and I am under no obligation to give them a positive review. If I hated it, I'd tell you. As part as my participation in the Under Armour What's Beautiful Competition, I created a team called Comfort Zone Crushers. The team is all about stepping outside your comfort zone to reach your goals, both mentally and physically. Honestly, the mental comfort zone is much harder for me. Shortly after creating my team, my blogger friend Bethany from Project Whitespace asked me if I would record a short vlog about why I love to run and to include an action shot of me running to be a part of a larger video that she was editing. I was pumped up on the Comfort Zone Crushers, so I said yes to something that I normally would have shied away from. Have you seen my blog intro video on my left side bar? Vlogs are not my strong point. I can express myself in writing much better than I can in video. I wasn't sure I could do a great job, but I agreed because I didn't want my What's Beautiful commitment to be all talk. I needed to take action. I needed to be a Comfort Zone Crusher. So I recorded a vlog that I felt like was so bad, that I almost didn't send it. After what seemed like a million takes, I was frustrated and done (almost in tears). I considered not even sending it, but I felt bad because I made a commitment to her and I didn't want to let her down. I decided to send my terrible video with an apology for its poor content and told her that I would not be offended in anyway if she decided not to use any of it. To my shock and surprise, I received a lovely email from Bethany the next day saying that she loved it and she could absolutely use it as part of her larger video. Maybe this just proves that we are harder on ourselves and judge ourselves more critically than other people do. Here's my video. I hope Bethany can work some editing magic. And then here is the one of me and Ollie running. I am looking forward to seeing Bethany's edited video of athletes talking about their favorite exercises. I think it is going to be great, and I will share it with you when it goes live. This taught me a little lesson and I decided to go one step further with Comfort Zone Crushers. If you haven't checked it out yet, head over to Under Armour's What's Beautiful site. They have challenges to complete online to keep you motivated as you work towards your personal goals. I scrolled through the challenges and completed all the ones that were easy for me. 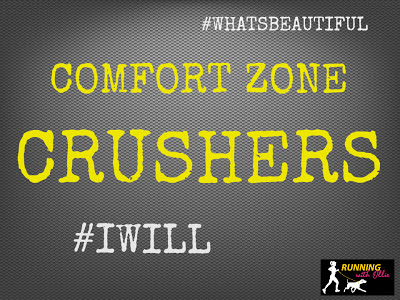 But do Comfort Zone Crushers ONLY do the things that are easy? No, no they don't. So I decided to take one challenge each week and complete it, no matter how far outside my comfort zone it is, and scrolling through the challenges, there are some that are way out there! You've declared your goal. Now let everyone know. Upload a video of you stating your goal and telling us how you plan to reach it. I shared my goal video with you in my original What's Beautiful Post. You can check it out here. Sign up for a competitive event and post your registration as a sign of your commitment. I signed up for a full marathon training with a running group. Post a photo or video of a record you are proud of. Could be something measurable or a personal victory. Anything that represents a time you really owned it. This was an easy one for me because once I placed first in my age group in a very small 10K. I was happy to share my accomplishment. Mile-by-mile, rep after rep, minute-by-minute, show your progress to the community and yourself. Keep track of all of your extra miles and above and beyonds here. I just record my daily miles here and some photos. So now it is time to pick a challenge that is a little scary and go for it. I plan to complete as many challenges as I can. QUEEN BURPEE Who is the Under Armour Queen of Burpees? Who can do the most in the least amount of time? And who can dethrone her? This week I may not be able to do the most but I will do them every day and document my progress. Check back for an update next week and an announcement of my next weekly challenge! Do you want to do these challenges with me? You can sign up on Under Armour's What's Beautiful site and create your own profile and complete your own challenges to keep you motivated. Who will be a Comfort Zone Crusher with me? I have a busy weekend ahead. I am excited because my summer marathon training group starts on Saturday at 6:20am (only two miles to begin) and I am running the Dallas Pretty Muddy mud run at 9:30am the same day!